When it comes to accommodation, Hoi An (Hội An) has an excellent selection of good value ones in different categories of price. Despite there are some hotels in the Old Town, there are a lot of options close by. Many midrange and budget accommodations are spread out to the northwest around Ba Trieu (Bà Triệu) and Hai Ba Trung (Hai Bà Trưng) Street. To choose the best places to stay in Hoi An, read on this article so you can plan as far ahead as possible. What Are The Best Places To Say In Hoi An? 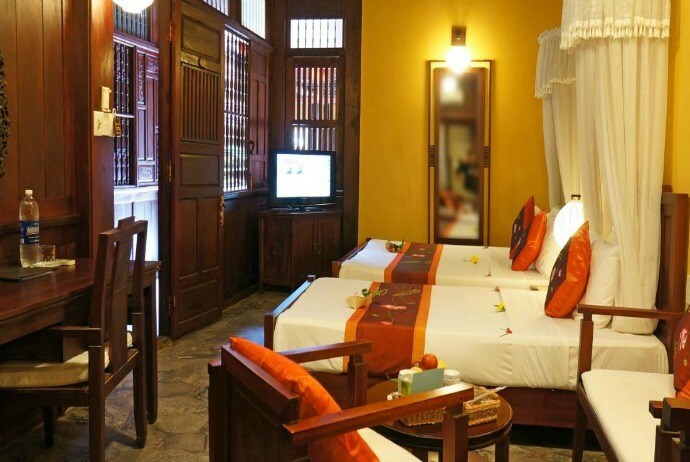 Thien Thanh Boutique Hotel supplies beautiful accommodation in the Ancient Quarter of Hoi An, a UNESCO Heritage site. 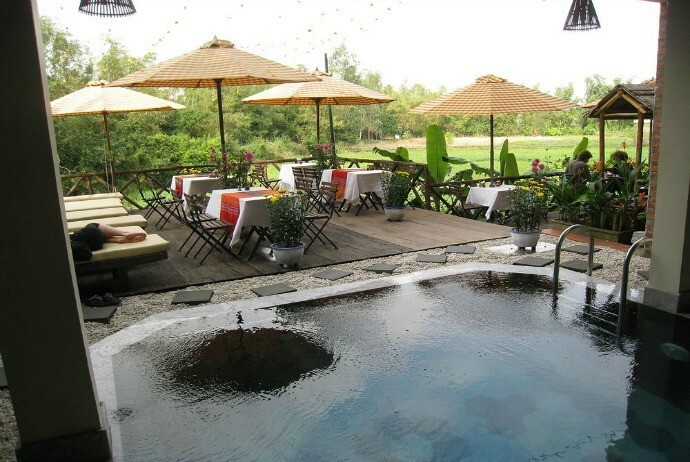 The hotel overlooks the rice fields and offering free Wi-Fi, a comfortable outdoor pool and a buffet breakfast. This hotel is decorated according to Asian style, with rooms having wood flooring along with furnishings. Rooms are air-conditioned and have cable TV, a work desk and a mini-bar. Some specific rooms have private balconies. Here, the tour desk offers activities such as Hoi An city walking tour, boat tours, and excursions to My Son ruins. If you want to relax indoor, the hotel supplies massage services. Tourists could also enjoy the dinners with candle light or contemplate the spectacular landscape at its restaurant’s deck. The menu includes Asian and Western dishes, and local specialties. Room service is supplied. It takes about 1 km from Cua Dai (Cửa Đại) Beach to get Thien Thanh hotel. Da Nang (Đà Nẵng) Railway station and Da Nang International Airport are approximately 30 kilometers away. This large resort with colonial style focuses on details with beautifully furnished rooms having a contemporary look along with wonderful bathrooms. Inside this resort, you will find an Irish pub, café, sublime riverside pool area, spa thanks to its expansive grounds. Situated in the French Quarter, the resort just takes a short walk from the town center. Located along the famous Thu Bon (Thu Bồn) River, Anantara Hoi An Resort, away 5km from Cua Dai (Cửa Đại) beach, offers a wide range of activities such as traditional Chinese painting. Tourists could learn conversational Vietnamese or take part in daily yoga classes. This resort also holds the boat trips along Thu Bon River plus with walking tours heading to the Marble Mountain and Cham (Chăm) Imperial City of My Son (Mỹ Sơn). For those guests who want to enjoy a relaxing day, the beauty treatments as well as massage service here are wonderful options. The resort has elegant rooms and each one features with a seating area along with private porch with nice views of the river and garden. The rooms are air-conditioned and feature with flat-screen satellite TVs and coffee/tea making facilities. Lanterns restaurant inside this resort offers delicious dishes in an open-air setting while Riverside Café offers warm drinks and a large array of tasty pastries. The O’malleys Pub provides guests with drinks and snack selections. Anantara Hoi An Resort is approximately 35km from Danang (Đà Nẵng) International Airport and about 135km from Hue (Huế) Imperial City. To sum up, Anantara Resort is an ideal place to stay in Hoi An if you are interesting in exploring the culture and history at your doorstep in the ancient town whilst enjoying a spot of indulgence. Despite it might lack a few of more luxurious facilities, it compensates with its perfect location, cozy boutique atmosphere, excellent staff and tasteful design. Refined and elegant, this hotel brings to guests a feeling of a colonial mansion rather than a hotel. Having 24 comfortable rooms, with each one including a private balcony that overlook the elegant restaurant and beautiful garden, Ha An hotel was the first boutique hotel of its type in Hoi An and has won much praise for that. Besides, thanks to the superb location, on a picturesque and rather quiet street, at the eastern end of the ancient town, this hotel is one of the best places to stay in Hoi An for tourists. One of the owners of this hotel is a French Vietnamese architect. The rooms inside have nice textile wall hanging or painting. It offers great views over a gorgeous central garden. With a lovely garden, great staff, the atmosphere of this hotel is relaxed and friendly. That is the reason why Ha An is one of the most popular hotels in Hoi An and with few rooms, guests should book in advance during the busy months. Along with buffet breakfast, Ha An hotel also offer dry cleaning/laundry. You just need to relax in the outdoor pool to feel comfortable after a long day of discovering the town. If you are wondering which place to stay while visiting Hoi An, then think of Ha An hotel which just takes 5 minutes of walking from the old town of Hoi An, and 20 minutes of biking to reach Cua Dai Beach and 45 minutes of driving from the international airport and train station of Danang. Some specific details of this hotel include: air-condition, a flat-screen TV with cable channels, a personal café, a mini-bar, a fan, and a wardrobe. Inside the hotel, you can find Memory Café which serves both Western and Asian delights. The snack bar offers a variety of refreshing cocktails, soft drinks and wines. Both are open from 6 pm to 10:30 pm. For the support of luggage storage, you can contact the reception 24/24. There is also a tour desk and a business centre. 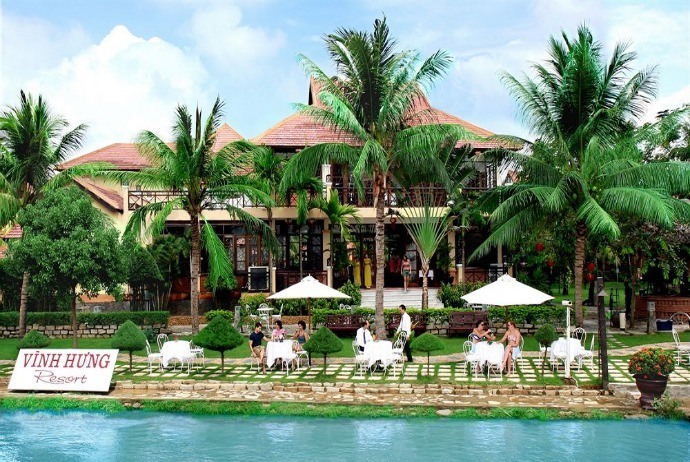 Situated at the bank of the romantic Thu Bon (Thu Bồn) River, this resort and spa provides guest with rooms offering views of the garden and river. This resort has 4 dining options along with free Wi-Fi. Being a well-known resort in Hoi An, this luxury resort is only 5 minute away from the old town of Hoi An. Staying at this resort can make your days in Hoi An more memorable. The resort and spa itself offers its gracious hospitality and luxury in a traditional environment of Vietnam. Having 82 well appointed rooms set in coconut-tree-shaded green lush gardens, a restaurant offering tasty both local and international dishes and two swimming pools set in the natural environment, this hotel is really a heaven for those guests who want to relax but still be within the reach of Hoi An old town. This resort offers a lot of services in order to keep its guests entertained, and cooling down during the hottest days of summer. Inside Vinh Hung Riverside Resort and spa also has a modern equipped fitness centre along with business center. 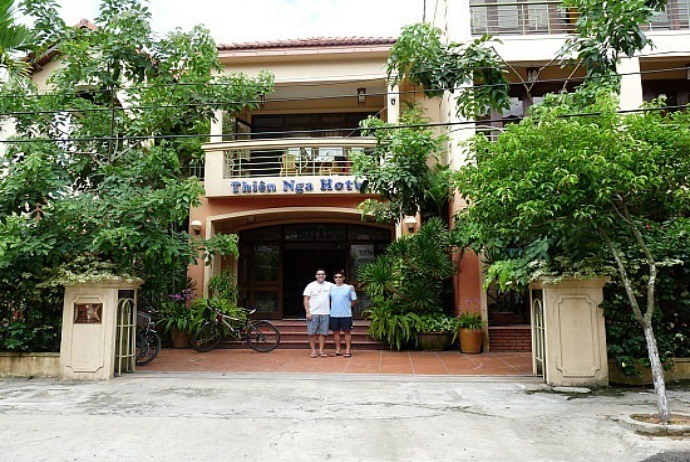 Another good place to stay in Hoi An is Nhi Trung Hotel, which is situated in the center of Hoi An’s Old Quarter. Having traditional architecture, the hotel includes 24 fully equipped rooms and is about 28 km from Danang International Airport. This hotel is designed according to the Oriental Style with different types of room style for guests to select from. The accommodation is cool and fresh. If seeing from the balcony, guests could see the quiet garden or the street. 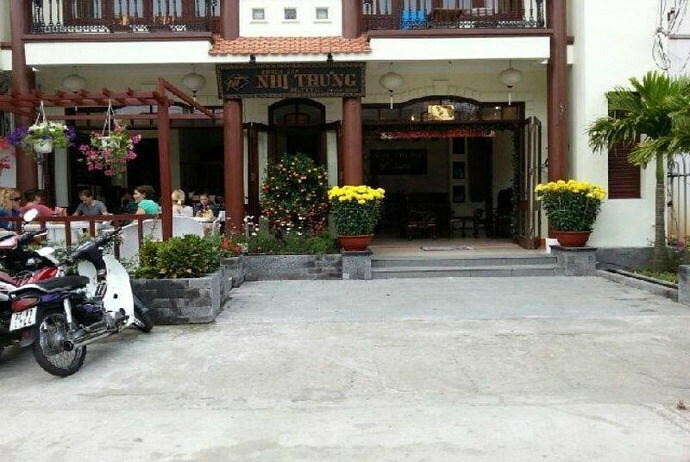 Modern, fully equipped rooms that are air-conditioned, satellite TV, hot water, mini-bar, bathtub, IDD phone, and free Wi-Fi… all make Nhi Trung hotel standing out from others in Hoi An. The food served here is Vietnamese and European. There are also other services provided in this hotel, such as car rental, booking for air-plane, bus and train, laundry and ironing service. Asian, European and Vietnamese dishes are provided by Nhi Trung hotel at the on-site restaurant. Guests who wish to explore main Hoi An attractions and landmarks of the town could get useful information from or book a tour via the tour desk of the property. High speed internet access is available, allowing guests to check emails, surf the web and keep in touch with their family and friends during their trip. 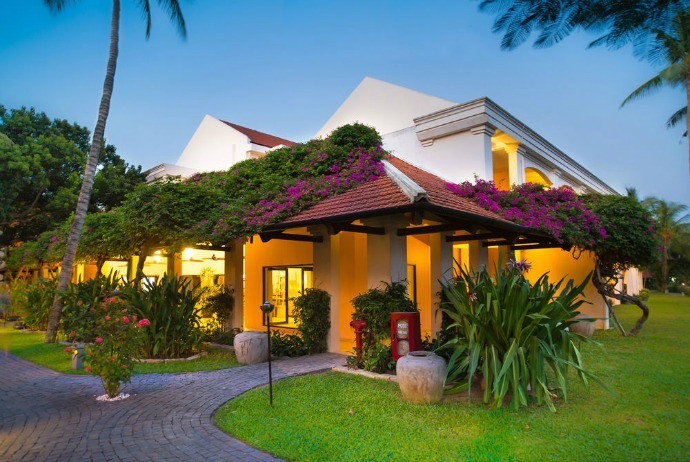 Just away about 1km from the town center, and several kilometers away from the beaches, Thien Nga Hotel offers comfortable accommodation in such a quiet, peaceful area of the old town of Hoi An. This hotel houses inside it a restaurant and supplies free Wi-Fi. The hotel is situated about 2km from An Bang public beach and 4km from Cua Dai (Cửa Đại) Beach. To get Danang International Airport, it takes about 35 km. This hotel possesses a good selection of rooms which are spacious, airy and light. In the superior rooms, there are balconies. Thien Nga provides guests with far more modernity along with comfort than other similar hotels in the area and the view from the balcony which are a big selling point. In each room, there are full facilities, including flatscreen TV, a full length mirror, mini-bar, safety box, WiFi, bedside plugs, and air-condition. The bathtub / shower combo and fixtures in the bathroom bring to guests a feel of modern. In general, rooms here are simple, comfortable, and tasteful. A small pool has been miraculously squeezed into the lobby area. For the rooms at the back of the hotel, they offer nice views over some of the rice paddies and gardens of Hoi An. The staff in Thien Nga hotel are attentive and smiley while buffet breakfast is generous. For other meals, there are a lot of other Hoi An restaurants and cafes within the walking distance of this hotel. However, the pool here is covered by a roof. The hotel is completely built from wood, with two stories. Offering elegant accommodation fitted with the antique furniture along with oriental rugs, Vinh Hung Heritage Hotel is situated in the ancient town of Hoi An, and just 200 meters away from Chua Cau (Chùa Cầu), also known as the Japanese Bridge. Guests just need to walk on foot for 15 minutes from Phuc Kien (Phúc Kiến) Pagoda or Hoi An Market to reach this hotel. All rooms in the hotel are air-conditioned and feature with unique decoration. Other convenient facilities in each room include a mini-bar, a 32-inch flatscreen TV with cable channels for the comfort of guests. Also, each room has a convenient bathroom with a bathtub. The kitchen of this hotel is situated on site and serves both Asian and Western cuisine for breakfast. Vinh Hung restaurant provides guests with lunch and dinner. Guests could request for laundry and dry cleaning services. This hotel also supplies car rental services and facilities as well. There is a tour desk helping guests organize excursions to the famous tourist attractions.